Delicious healthy fritters without frying? Yes, please! 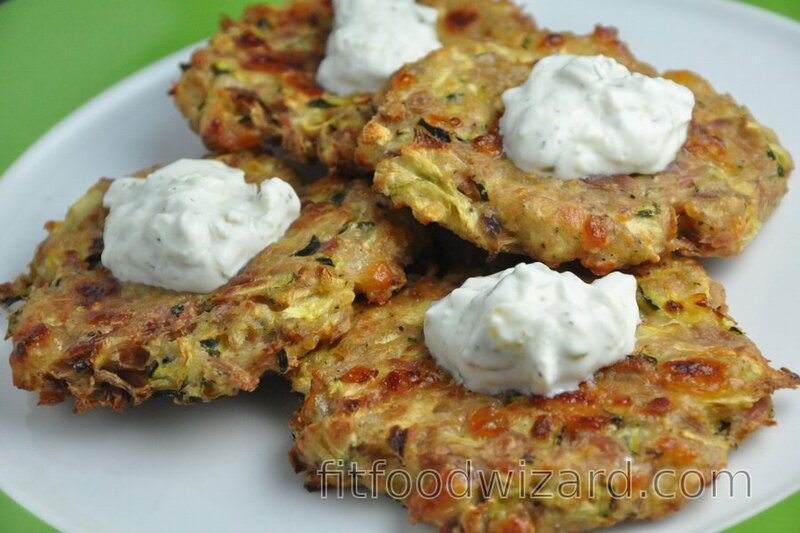 You will fall in love with these baked zucchini-tuna fritters. Moreover, you can prepare them absolutely flour-free and gluten-free. This zucchini recipe is not only among my favorite ones, it has also became one of the most popular recipes on my website. And I am very excited that you like these fit zucchini-tuna fritters so much. To show you how easy it is to prepare them, I made a short video recipe, you can find it below. For the best result, try to drain as much water as possible from zucchini during preparation, they will be more firm, more crunchy, and you will hardly find any difference from fried fritters. These healthy fritters have higher protein content and low calorie and fat content at the same time. They are ideal for dinner, but you can also enjoy them for breakfast or as a morning snack. You can prepare them with spelt flour or whole-wheat flour, or you can use buckwheat flour or ground nuts for the gluten-free version. I recommend to serve these fritters with a simple slightly sour yogurt-pickles sauce that is mightily great with them. Try out these healthy fit fritters, I'm sure that your entire family will fall in love with them. Grate zucchini and transfer into a bowl. Sprinkle zucchini with sea salt and let sit for 10 minutes. After 10 minutes, using a cloth or strainer, drain zucchini as much as possible. Put dry zucchini back into the bowl and mix with other ingredients for fritters. Shape dough into fritters and place them onto a baking sheet lined with parchment paper. Bake at 200 degrees Celsius (390 °F) for 20 to 23 minutes until brown – in the middle of baking, flip them onto the other side. Prepare sauce by mixing yogurt, finely shredded pickles, spices, and sea salt. Serve warm, together with the sauce. Enjoy!